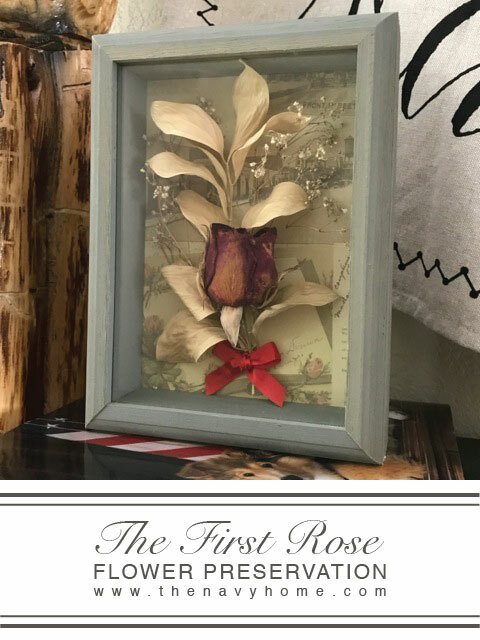 The First Rose continues to be one of my favorite projects to this day and beautifully resides on our Storytelling Fireplace mantel. This shadow box is the perfect addition to our homes living area for it serves as a conversation piece as well as a visible daily reminder of the wonderful husband and beautiful life God has graciously blessed me with. 🙂 Are you ready to preserve your own special moments? You can find written instructions below; however, I do not have pictures of the process for making this shadow box since I had made it some time ago. If you would like some visual aids along the way, check out my other post, Treasured Shadow Box. 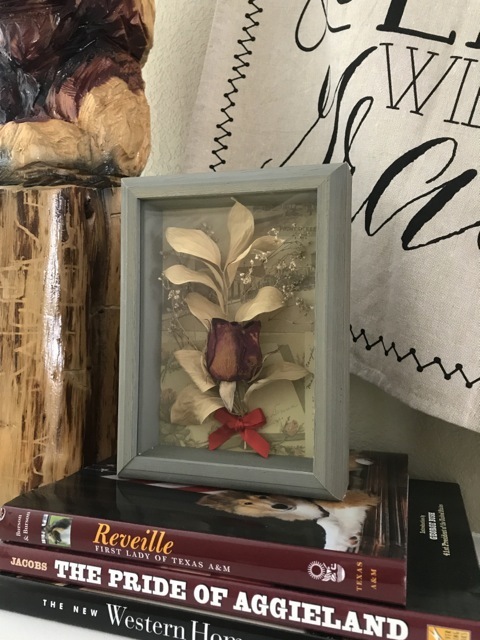 A Treasured Shadow Box and this project follow the same basic process: you begin with the background first and then move forward towards the glass of the shadow box. The first step is to select a decorative piece of scrapbook paper that compliments your dried floral arrangement. Cut the paper to fit the back panel of the shadow box and use a glue stick to attach. Using a glue stick for adhering the scrapbook paper will prevent any uneven or warped surfaces. Cut and arrange the floral to your satisfaction if adequately dried and ready for use. Take care to test the placement of your floral so it does not interfere with the 1/8-1/4” lip of the framework when assembling the shadow box. Attach your floral arrangement to the previously assembled background panel with a hot glue gun. To make for an easier assembly, place small beads of glue in multiple locations to stabilize your arrangement. And now for the finishing touch! Cut and tie your ribbon into a bow and attach to the base of your floral arrangement with the hot glue gun. Note: Follow these steps if you are unsure of how to dry your floral. Wipe off any excess water from the stems and hang them upside down for a few days to a week until dry – I have tied mine onto a cabinet knob or clipped them onto pants hangers. I recommend hanging them in a well-ventilated space to help them dry quicker in addition to not getting icky. Keep in mind that if your floral is not completely dry when worked with, it will continue to dry over time and change color. The greenery in this project continued to dry after assembly and became less green over time than when I first made it, but that is okay, because I actually love the way the colors work with the background! Please leave a comment to share your thoughts with us!